I bottle-raised Lily from 2 weeks old when her in-captivity mom abandon her at a zoo in New Jersey. I am deeply sadden to say that Lily died on 2/7/11 attempting to come out of the woodchuck hibernation. It takes great energy to get the muscles moving and system jump-started and for whatever reason she had trouble. Know that she was comforted and loved in the last hours of her life. Lily educated over 700 children and adults during her 22 months of life. She will be missed for the light she shined on all of us. I was hoping to obtain a baby woodchuck Spring 2011. Although this chuck would never have replaced our Lily, it would’ve continued the legacy she began on educating people about her species. I chose not to acquire another woody at this time because of the complex metabolic system of the woodchuck and the genetic disorders that can shorten their lifespan. Perhaps in the future. Lily was an amazing animal and had a tough start in life. She would have fur then lose it in different spots each time. She felt the call of the wild in August 2009 and ran off one day while we were walking (without a leash). I guess she did the woodchuck stuff like dig tunnels, prep a den and get ready for winter but knew nothing about foraging for food. She found her way, a month later, to the neighbors porch and looked in the window. They called us & I retrieved my precious pal when she ventured from her hole. She didn’t hibernate that winter. She would look out the window in the animal room at the snow. Spring 2010 she went into heat, and seemed to stay there. Nasty Lily she became. I lost that loving little woodchuck. She even chewed through two metal screens and jumped 3 feet from the window to the ground to escape the animal room. I found her nesting on the ridge in a woodchuck hole, but she wouldn’t come out for me. I had to use a hav-a-hart trap and it was her stomach that got the best of her! She was spayed in May but still didn’t settle down. She educated here and there. By October she had become that lovable little chuck again…all 13 pounds of her. She got sleepy towards the end of the month and went into hibernation. Every now and then I would stick my hand into her nest to make sure she was still alive. I probably didn’t have the heat set high enough in the animal room but figured she was awake the year before and it was cool in there then. February 2011 came and I found her seizing outside her nest. Try to get a vet on a Sunday! Harder still is finding one who is knowledgeable about the woodchuck’s complex system. I couldn’t find anyone willing to see her. Monday came and I rushed her to the vets where I was told the exiting from hibernation can be pretty horrible and she was normal. 3 hours later Lily was dead. My heart broken. So many unanswered questions. Like did spaying her upset the brown fat? Did she have the hepatitis b virus that so many are born with which leads to liver cancer and death before 2 years old? Was she not warm enough? Was she too fat? I opted out for a necropsy and went with a private cremation. Lily’s urn sits alongside the 10 cats on our memorial table with her green turtle, rubber bear and a chew stick. The cremation service included a clay footprint. I can’t tell you how much research I did following her death. I keep telling myself that I will sit down to write Cornell to see if they have any answers. 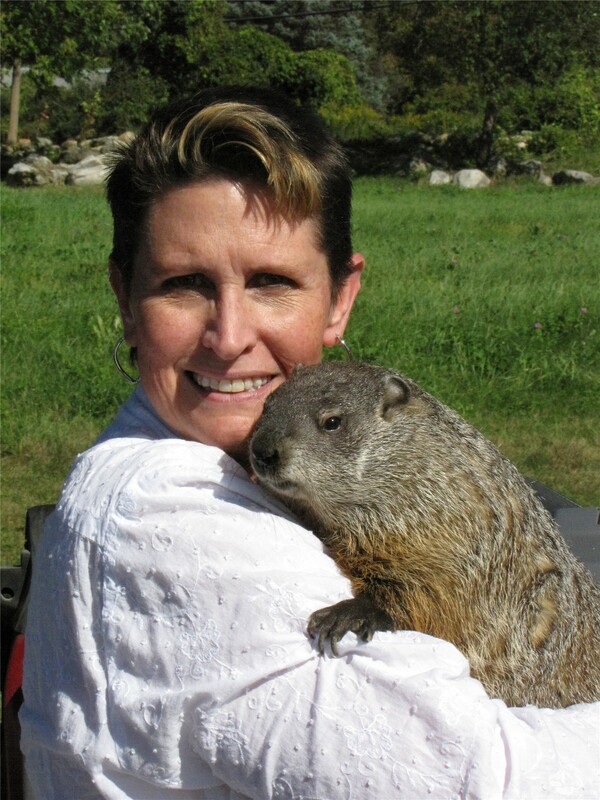 They have studied woodchucks since the 60’s and raise the only disease-free colony. This is why I decided not to get another woodchuck. They live to eat and hibernate and have short life spans. Not many are used as animal ambassadors because of their “kill them all and let God sort it out” attitude. And attitude Lily had. You had better have her food ready when she wanted it otherwise she was charging at you chattering her wicked incisors. Once she had me standing on her chair in her cage screaming for help. She gave me a good bite on the top of my foot. That was the last time I visited her barefoot. She could also be sweet. Mom would hold her and she would nuzzle her nose against mom’s cheek. Very endearing. With me she would give me a little love bite on the chin but still endearing. I loved her smell of garlic or onions along her cheek scent glands. I really hope I did right by Lily. I know she ate well, got lots of love and had wonderful habitat. There is little to nothing when it comes to information on the animal husbandry of a woodchuck in captivity. Someone should write one. I may post more photos down the road.